For years, I had been using one tried-and-true marinade for flank steak, but then I saw this recipe in The Junior League Centennial Cookbook. It sounded interesting, and I had all the ingredients, so I thought I would give it a try on some tri-tip for a dinner with good friends this past spring. Since then, I have made it several times with the following modifications: The original recipe called for soy sauce, but I always use a low-sodium variety; and I have never tried it with the recipe’s suggested celery seed or dill, but I like adding green onions. I prepared this for a recent party (where the photo above was taken), and I had a bag of limes in the refrigerator, but no lemons, so I used lime instead of lemon juice. I didn’t notice the difference, and the guests all loved it. I served it with a spinach salad with blueberries and almonds, grilled zucchini, grilled green beans, and ribs—but it would also taste great with Quinoa Salad, for which I’ll post a recipe later this week. Make marinade by combining lemon juice, soy sauce, wine, oil, Worcestershire, garlic, pepper, and green onions. Place tri-tip steak in a dish or a zip-lock bag, pour the marinade over it, cover or seal tightly, and let stand in the refrigerator for at least 2 hours—or as long as 12 hours—turning once or twice. Tina’s Tip: I like to marinate the steak for at least 12 hours and usually 24 hours. Recipe adapted from The Junior League Centennial Cookbook. 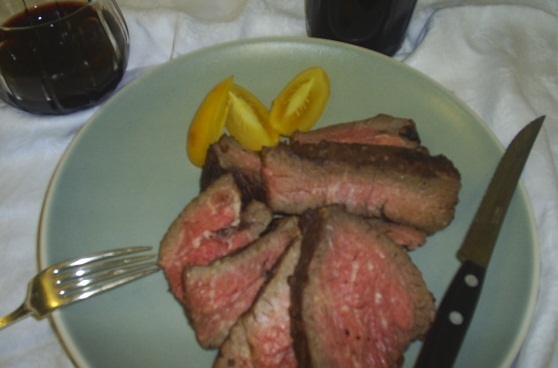 This entry was posted in Meat, Recipes and tagged Beef, Dinner, Recipe. Bookmark the permalink.